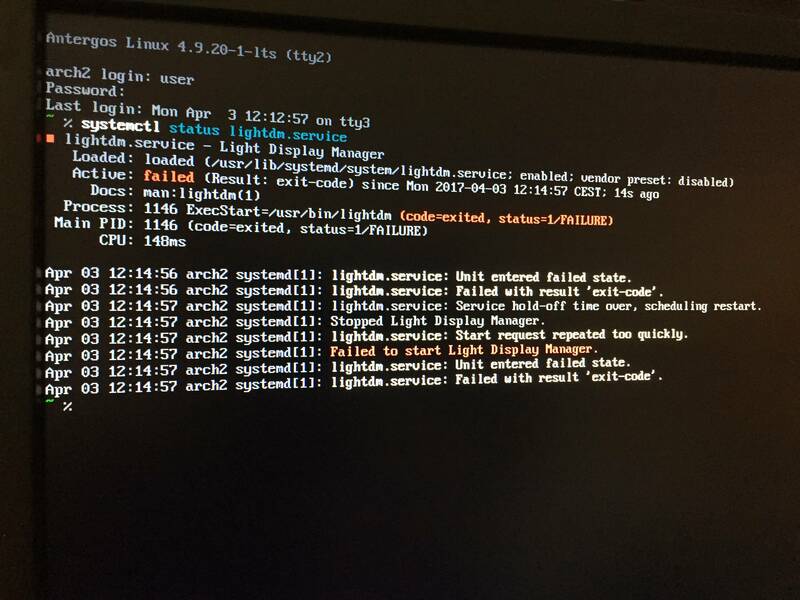 I have just installed updates after a month of productive uptime, and upon reboot, I am greeted with this LightDM failure. I tried installing and switching to gdm, but that just leaves me with blanking cursor on boot. I also tried re-installing gnome, with no luck. I’m rocking the latest nvidia drivers as well. Does anyone have a similar issue? I really need this machine for work, any ideas/suggestions are welcome. It might be a driver issue. EDIT: Driver issue confirmed. After removing the graphics card, and booting via integrated intel graphics, I am able to go straight into Gnome desktop without issues. Are you shure running LTS Kernel ? But i use gdm at the moment and as you can see X starts just fine. Do you try reinstalling the nvidia driver ? And do you have maybe a /etc/X11/xorg.conf file? And doing updates ones a week saves from bad issues a lot!!! I tried gdm, no luck. Do you have it working now on LInux 4.9.20-1-LTS and nvidia-lts 378.13-4? ==> No kernel extramodules-4.9-lts headers. You must install them to use DKMS! Do you try to use Nvidia DKMS before? or needing DKMS for somethiung else? @joekamprad I’ve just noticed that linux-lts and nvidia-lts were updated today. The update has fixed the issue, everything works perfectly now.